Emergencies can happen anytime, anywhere. And while it’s impossible to anticipate when you might face an emergency situation, it is possible—and necessary—to plan ahead so that you’re prepared, especially when you have pets. A pet emergency can be anything from your dog ingesting poison to a natural disaster that forces you to evacuate your home. And while the exact steps you take depend on the situation itself, there are some general guidelines that all pet parents should follow in order to ensure there are protections in place. If an emergency requires that you evacuate your home with your pet, be sure to take the kit with you. Also include contact information for your vet, local animal hospital, and the ASPCA’s pet poison control hotline (888-426-4435). Emergencies can happen without warning, and you might not always be with your pet when they do. For this reason, it’s incredibly important that your pet has the proper means of identification so you can be reunited later on. This includes ensuring your pet’s tags have current information, and that not only are they microchipped but their microchip is up to date. Go to the Universal Pet Microchip Lookup to verify the information on your pet’s chip, and make any necessary changes right away. During an emergency, you may be forced to leave your pet with a shelter, boarder, or vet. And if they’re unfamiliar with your pet, they will likely require vaccination records. Ensure that you always have them with you by keeping a record of them on your phone. If you store your pet's vaccination records in your email or Google Drive, be sure to also take a screenshot so you can quickly access them in your Photos app. 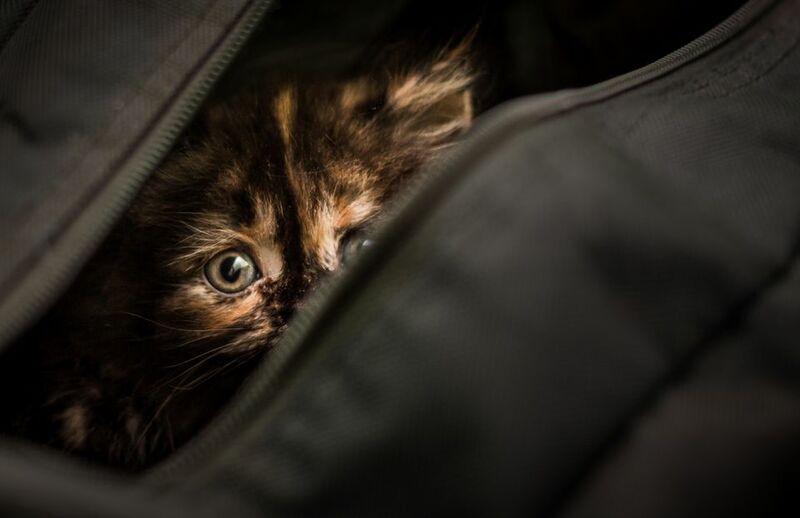 Even if your pet never travels with you, it’s still a good idea to have a crate or carrier you can use to securely contain them or take them with you in an emergency. Do your best to get them well-acquainted with the carrier during times when it’s not a necessity. Keep it accessible early on, and put toys and treats in there to encourage your pet to go inside and explore. Some pets love carriers, others loathe them. Either way, it’s important your pet has one they’re familiar with to reduce stress in the event you need to use it. Don’t just try to wing it in the event of an emergency. Have a plan in place that covers what you’ll do in the event you’re home and the event you’re not home. This includes having an emergency contact who has agreed to go to your home and get your pet if you can’t (and making sure they have access) and keeping a list of local evacuation shelters that will allow you to bring your pet (and alternately, local animal shelters that will take in pets if the human shelters won’t). A rescue alert sticker is a sign you put on your front door that let’s emergency personnel know if there are pets in the home. That way, if for example, there’s a fire at your home when you’re not there, the fire fighters will know there are pets that need to be rescued, including how many and what kind. If you evacuate your home with your pets in an emergency, write “Evacuated” on your rescue alert sticker so anyone who comes by knows the pets are safe and out. Get a free rescue alert sticker from the ASPCA here. There’s a lot to think about when you’re planning to evacuate, but don’t let your pet’s bathroom needs slip by. Both cats and dogs may have trouble going to the bathroom in unfamiliar environments, which can cause serious health problems. For cats, gather what you need for an on-the-go litter box; an aluminum baking tray and a container of litter or dirt should be just fine. For dogs, work on encouraging them to use pee pads, or invest in a faux-grass potty pad. It’s a bit extra to carry, but will save you from a major additional stressor. Anxiety is high in emergency situations, for pets and people alike. Fortunately, there are some things you can do to take the edge off for your animal companion. Consider supplementing your pet first aid kid with some anti-anxiety aids, be it natural sprays, CBD treats, vet-prescribed medications, or anything else that can help reduce stress for your pet. They might not completely calm them, but an anti-anxiety aid should provide at least some reduction in the stress they’re feeling. Don’t wait until the last minute to ensure you have an emergency plan in place for your pet, especially if you live in an area prone to natural disasters. Be ready to take action immediately, and whatever you do: never leave your pet behind without a backup plan.